Commerce Construction served as the general contractor for the construction of two fish passage facilities for Exelon Power at dams along the Schuylkill River, west of Philadelphia. The passage facilities were installed to enable the seasonal migration of native fish around dam structures that were built in the early 1900's. These dams were owned and maintained by Exelon to hold back cooling water for their power stations. 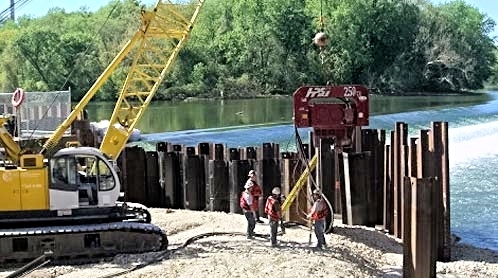 This 2.5-year project consisted of installing temporary sheet pile for cofferdams, ongoing dewatering, and excavation deep into bedrock and below the river bottom. Complex reinforced concrete forming and placement, as well as mechanical and electrical system installation, occurred while the cofferdams and pump system maintained dry conditions. This work was in direct contact with the existing and historic dam structures and occurred within county parklands and sensitive wetlands. Ever-present public and government attention on these two sites made for projects that were both technically challenging, yet rewarding for their contribution to the community and the river's fish habitat.